Antarctica might be one of the most inhospitable regions on the planet, but it is a mecca for astronomers. Its cold, dry air enables observations that can't be done elsewhere on Earth. The South Pole has hosted telescopes for decades. Now, researchers are eyeing a new location - Dome A, which offers a unique opportunity to study the universe at little-explored terahertz radio frequencies. "Dome A is the best site we've found - very flat, very calm winds, and the driest place anywhere on the planet," says Qizhou Zhang of the Harvard-Smithsonian Center for Astrophysics (CfA), co-author of a new study appearing online in the journal Nature Astronomy. Dome A is the highest point in Antarctica, with an elevation of more than 13,000 feet (4,000 meters), comparable to Maunakea in Hawaii. Unlike the South Pole, it isn't visited by aircraft. Instead, researchers must trek inland from the Antarctic coast, a journey of some 750 miles (1,200 km) that takes up to three weeks to complete. As a reward for these herculean efforts, scientists can access a type of light known as terahertz radiation, which has frequencies higher than 1 trillion hertz (1,000 times greater than the frequency used by cell phones). This radiation comes from cold clouds of interstellar gas and dust. By studying it, we can gain new insights into the origins of stars and galaxies. Because water vapor in Earth's atmosphere absorbs this radiation, few places on Earth are suited for terahertz observations. Instead astronomers have relied on aircraft and space missions, which are more costly and less flexible. The solution is to find an extremely dry location. Zhang and CfA co-author Scott Paine joined with their colleagues at China's Purple Mountain Observatory, led by principal investigator Sheng-Cai Shi, to create and deploy instruments to measure the conditions at Dome A over a span of 19 months. The data gathered there will also help inform climate models. "The water vapor in the Earth's atmosphere that obscures our view of the cosmos also blocks infrared radiation escaping from the Earth's surface towards space, which is the essence of the greenhouse effect," says Paine, who studies atmospheric radiation. The team found Dome A is frequently so arid that if all the water vapor in a narrow column stretching straight up from the ground to the edge of space were condensed, it would form a film less than 100 microns thick. That's about 1/250th of an inch, or twice the width of a human hair, and about 10 times less than that over Maunakea, one of the world's best astronomical observing sites. Moreover, Dome A offers a natural laboratory for studying the effects of water vapor on atmospheric absorption at extremely low temperatures. The cold Antarctic atmosphere provides direct access to conditions normally found in the Earth's upper troposphere. Developing Dome A into a permanent observatory for astronomy and atmospheric science will involve significant challenges. 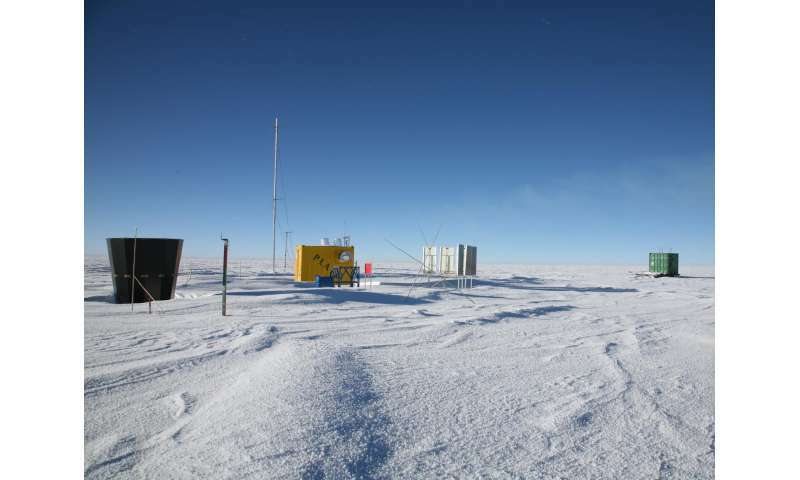 In return, researchers stand to gain a unique location for conducting scientific research.